Jedi Master Plo Koon is one of those characters Hasbro keeps revisiting fairly regularly ever since we saw him in Episode I. With every movie released we were treated to a newer, improved mold up until 2005, with the Revenge of the Sith version. 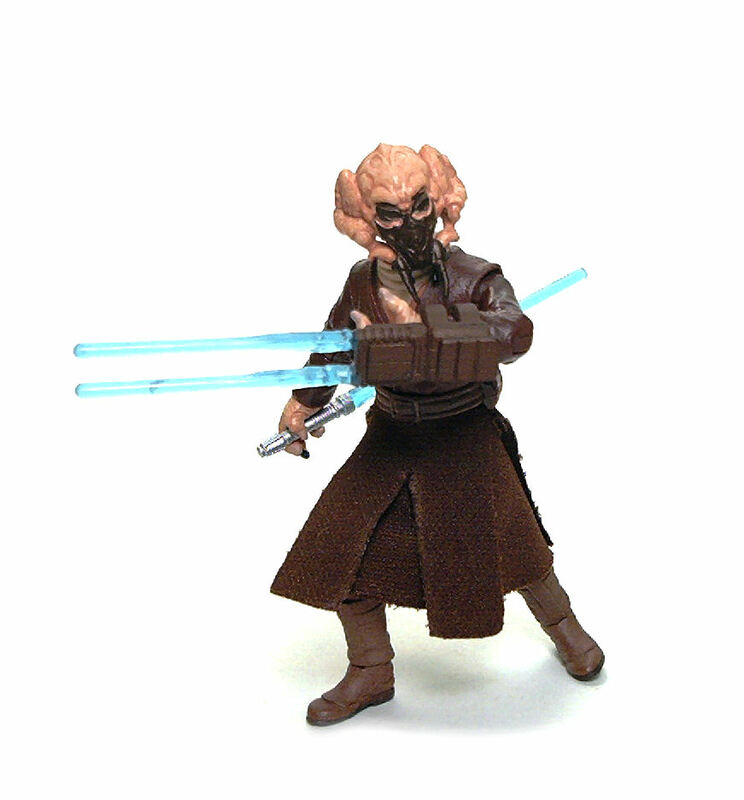 From a purely aesthetic standpoint, Plo Koon doesn’t look all that much different from the Saga Legends version, which might lead to some confusion, as both are available at stores right now. 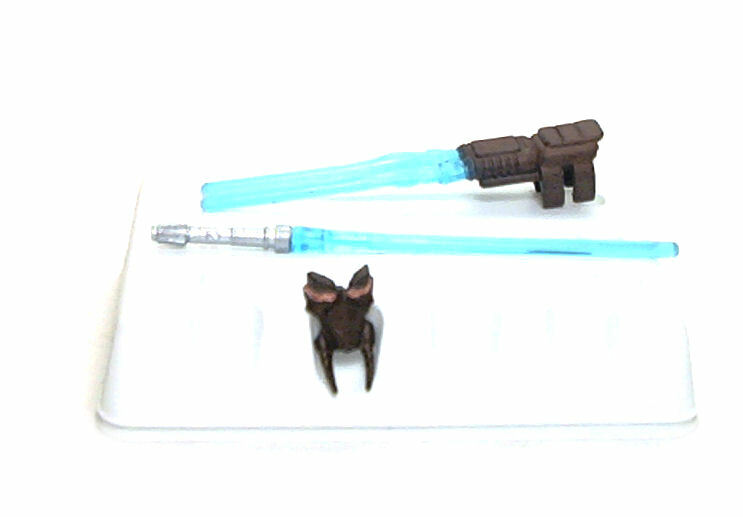 However, while the Saga Legends Plo Koon is a straight repack from the 2005 RotS mold, the Legacy Plo Koon does have some newly designed pieces, starting with matching knee joints (for some reason the RotS version had two structurally different hinges at the knees) and improved elbow joints. 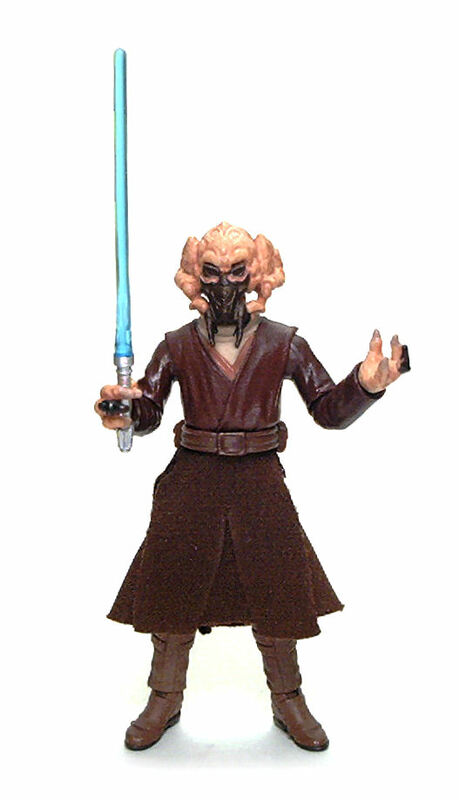 The new Plo Koon has also a two-piece fabric skirt and a new head sculpt to provide for the featured “gimmick”, the removable facemask. Now, this feature is a really polarizing subject, as some people hate it while others (like me) actually find it cool. The main problem is that the piece seems to fall-off rather easily once it’s been removed from the head. While on package, it stays well secured and the first time you pull it off, it does feel like it grips the face tightly enough, but as you manipulate the figure it soon becomes obvious that friction is not enough to keep it in place. Of course, there are ways to fix it, from superglue (shudder) to poster-tac (it works), but since I no longer play with toys (no, really!) I decided to just leave it be. 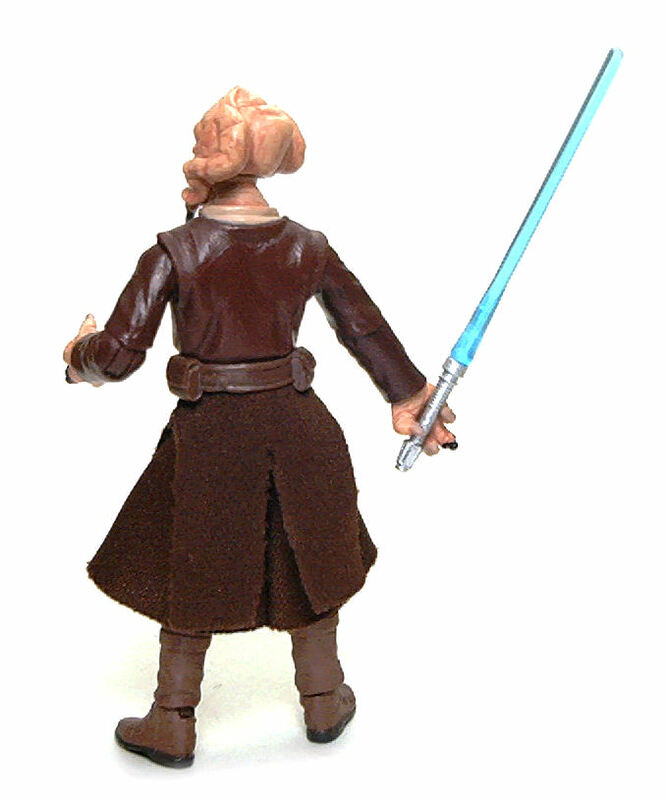 The plastic robes on Plo Koon don’t have a lot of sculpted detail, especially considering that fabric covers a good portion of the figure, but the level of detail is nice and well achieved. The more intricate parts are definitely the hands and the head, which are molded in a light orange-pink skin tone and have a very subtle dark brown wash over them to bring out the textures. The unmasked face is something of a surprise, as master Plo seems to lack a proper mouth or nose, instead lumping both the olfactory and taste organs into a fleshy cavity at the center of his face. Overall, the sculpted face is good, but I think Hasbro should have painted the inside of the mouth to offset the toy-ish look of the cavity. In fact, I bet the thickness from a coat of paint would improve the grip from the mask, not to mention the looks of the unmasked Jedi. • Ball jointed neck. Great range all around. • Peg & hinge shoulders. These feel rather tight, but have good motion range. • Peg & hinge elbows. Great 90°-ish bend and 180° sideways rotation, although not quite to the point to achieve natural two-handed lightsaber poses. • Swivel wrists. Excellent range in here. • Swivel waist. Very good swivel, although it tends to misalign the fabric skirt. • Swivel hips. Good range on both sides, not quite to 90° but enough for sitting in a cockpit. • Peg & hinge knees. Nice near 90° bend and free swivel on both knees. • Peg & hinge ankles. Good up/down range and free 360° swivel. Plo Koon comes armed with a lightsaber and “lightsaber gauntlet”. Both are molded out of translucent blue plastic with only the hilt and gauntlet body painted in silver and dark metallic brown, respectively. The lightsaber is a fairly standard weapon, but the gauntlet is basically a bracer that sprouts twin lightsaber blades, akin to the toy Wolverine Claws you could see at stores last year. The piece has a couple of clips to secure it onto the figure’s forearm, but I think it is better to simply pop off a hand, slide the gauntlet in and replace the hand. To my knowledge, the gauntlet hasn’t really been featured anywhere, but since the Clone Wars animated style figure had it; I guess it’s only a matter of time before it appears on screen some time. 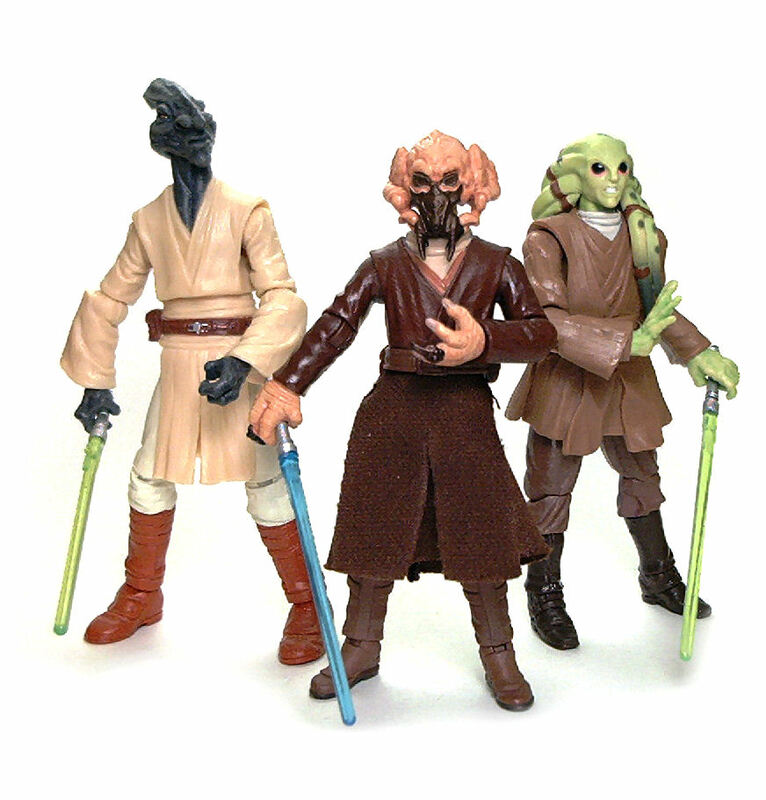 If nothing else, it does serve as an easy way to distinguish the Legacy Plo Koon from the Saga Legends version at stores. The removable mask itself is quite an ingenious little piece. 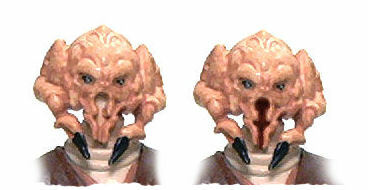 The breathing gear is meant to be composed of the separate goggles and the mask, which supposedly connect to a couple of Plo Koon’s lower facial appendages. However, to achieve the look Hasbro had to make it all as one piece, sculpting and painting a section to resemble the skin of the face, so when the mask is on, it looks like the goggles are separate pieces and the ends of the inner tentacles are fitted inside the lower tips of the mask. All in all, it is a very elegant solution, in my opinion. Plo Koon shipped originally as part of wave 11 from the Legacy Collection, but also as part of the wave 12 and it’s subsequent revisions, meaning he can be found with different Build A Droid pieces. 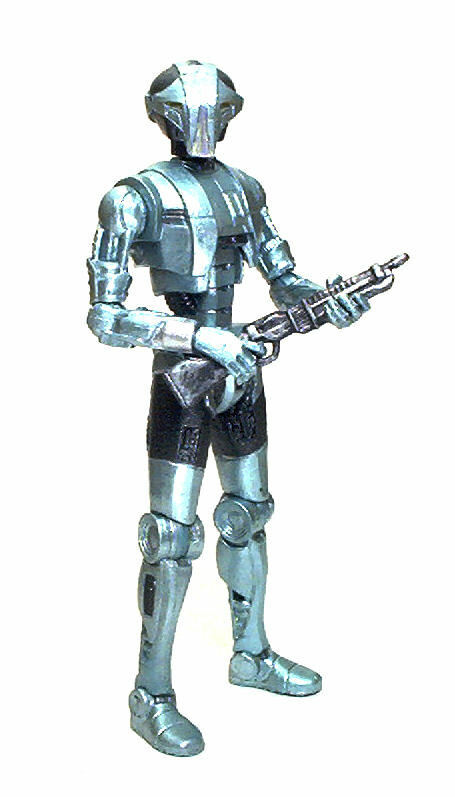 The ones shipped with wave 11 had a the head & blaster required to build the YVH-1 droid, while the wave 12 figure comes with either the head & blaster for the HK-50 droid (pictured) or the left arm, depending on the case revision. 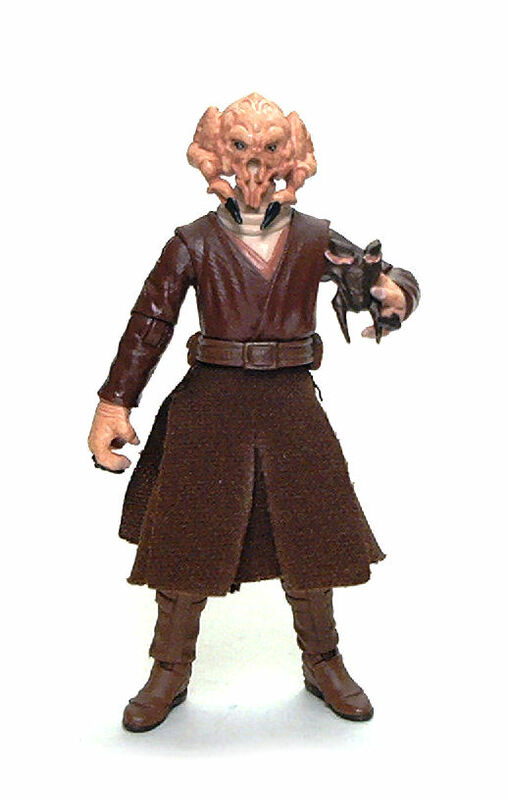 So, while the ease with which the removable mask falls off might deter some from getting this version of Plo Koon, I do think the figure has enough merit to have a place among my alien Jedi collection.